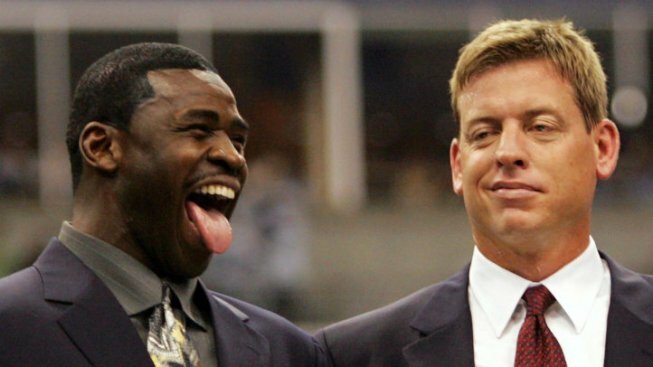 Michael Irvin on San Antonio Talk: "That's Our Area"
As an old Dallas Cowboy, there’s something about the notion of an NFL team coming to San Antonio that Hall of Fame receiver turned NFL Network analyst Michael Irvin doesn’t much like. Specifically, it would mean less Cowboys fans in San Antonio. The Raiders and San Antonio have flirted in the recent past, and that picked up again Tuesday after the team withdrew their request for relocation to Los Angeles—the plan that would’ve sent the Raiders back to LA failed in favor of a plan that will send the Rams, and give the Chargers a one-year option to mull relocation. Since then, former Vikings owner Red McCombs has essentially said San Antonio is ready for the team whenever the Raiders are, and even went so far as to offer to invest in the team. In a recent appearance on ESPN Radio, Irvin jokingly laid out his feelings on the matter. "That's our area,” Irvin said, via the Dallas Morning News. “We won't just open that area up. I'ma have to tell Jerry (Jones), 'Get down there and get in that courtroom and block all this [inaudible] stuff from happening.' What are you talking about? Those are Cowboy fans out there, and they should always be Cowboy fans up in that area ..."